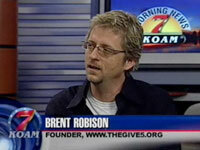 TheGive5 founder, Brent Robison, visited CBS/FOX's Pittsburgh, KS affiliate (KOAM) for their morning show today, Friday, July 10. In case you weren't able to view it, click "more" to watch the interview. Be sure to "Share!"